On Monday 25 April, a panel of non-governmental organizations (NGOs) spoke at the side event for government delegates to the Convention on Biological Diversity’s Subsidiary Body on Scientific, Technical, and Technological Advice (SBSTTA), meeting in Montreal. The panel featured representatives from Third World Network, ECOROPA, the Federation of German Scientists, and the ETC Group. The event was very well attended, with some delegates unfortunately unable to fit in the conference room due to space constraints. Introduced by moderator Lili Fuhr of the Heinrich Boell Foundation, Jim Thomas of the ETC Group was the first speaker. Thomas provided an overview of recent developments in synthetic biology, highlighting how some companies are moving toward use of “methanogens” to produce their products, referring to synthetically modified bacteria that feed on methane. A shift away from sugar as synthetic biology’s preferred feedstock for industrial fermentation meant that relationships were building between synthetic biology and fracking companies, Thomas said. Thomas also explained the industry’s headlong plunge into manufacture of synthetic replacements for natural products, such as synthetic vanillin (vanilla), which could displace farmers in Madagascar, and synthetic vetevier oil, which threatens the livelihood of Haitian farmers of vetevier grass, the natural source of the fragrance used in cosmetics and other products. At this point, Thomas emphasized, there was no international forum where countries like Madagascar and Haiti could raise a discussion about threats to their farmers. He called for the Convention on Biological Diversity (CBD) to establish one as part of an ongoing effort to address the impacts of synthetic biology. Christine von Weizsaecker of ECOROPA who has followed the CBD since its inception made the next presentation. She explained key parts of the route by which the Convention has come to discuss synthetic biology’s implications. She explained how synthetic biology relates to the CBD’s three objectives of conservation, sustainable use, and fair and equitable benefit sharing from use of genetic resources, and aspects of the relationship between the CBD’s consideration of synthetic biology and its Cartagena Protocol on biosafety related to genetically modified organisms. In the present, many living organisms produced by synthetic biology are covered by the Cartagena Protocol, although addressing them requires updates to risk assessment and risk management approaches, von Weizsaecker highlighted. The components (e.g. DNA) and products (e.g. synthetically produced biochemicals) of synthetic biology fall outside the Cartagena Protocol but are within the scope of the Convention, thus necessitating a response by other elements of the Convention, such as the Nagoya Protocol on Access and Benefit Sharing, and to address social, economic and ethical considerations stemming from synthetic biology’s impacts. Next up was Ricarda Steinbrecher of the Federation of German Scientists, who explained how gene editing technologies work, particularly CRISPR-Cas9, and who discussed gene drives, a gene editing application that has raised especially high concerns about its potential biodiversity impacts. The technical side of Steinbrecher’s presentation showed how CRISPR can be used to edit genes by targeting specific sequences with DNA cutting enzymes, resulting in replacement of the target gene. She discussed how sequences are often repeated within a genome, often as an artifact of evolution, and expressed concern that there is mounting evidence that gene editing can have unpredictable “off target effects”, i.e. that it may cut and replace not only the target gene but other genes with the same partial sequence elsewhere in the genome. Finally, Steinbrecher noted that, in some countries, CRISPR is falling into a regulatory void, noting that the US Department of Agriculture (USDA) had recently declined to regulate a CRISPR-engineered mushroom, saying it was outside USDA’s biotech regulations. Steinbrecher also discussed gene drives, and how they can overcome Mendelian laws of inheritance in sexually-reproducing species. Gene drives can rapidly distribute a trait across a population, or even an entire species, she explained, and this can be achieved particularly quickly in species with a short reproductive cycle, such as many plants and insects such as mosquitoes. Steinbrecher drew attention to the irony of discussions about using gene drives to re-introduce herbicide susceptibility into weed species that have developed resistance to herbicides due to their higher use with genetically engineered crops. Steinbrecher further explained that gene drives were potentially so powerful and serious in their implications that even proponents of the technology were considering a moratorium on its use, and drew attention to the potentially disastrous effects of an accident. Noting that an escaped gene drive could transform a species quickly and irretrievably, she said there is a need for especially high standards of laboratory biosafety for any gene drive experiment. Edward Hammond from Third World Network rounded out the presentations by discussing how the combination of modern genome sequence technology with gene editing is poised to transform the way in which genetic resources are accessed. New technologies are replacing the need to physically transfer biological samples, such as seeds, microbes, and plant cells. This poses a challenge to typical access and benefit sharing (ABS) approaches and laws, which frequently rely upon material transfer agreements. 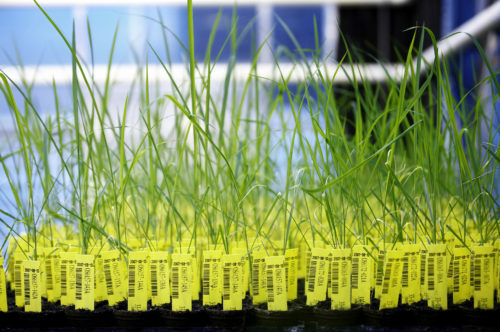 Hammond explained how whereas 10 or 15 years ago it was news that “the genome” of a particular species, such as a crop like rice, had been sequenced, but that only referred to a single representative genome from the species. In contrast, today, with less costly and faster technology, genome sequencing projects were thinking in terms of hundreds and thousands of genomes from a single species, and that new databases thereby will come to contain a far greater proportion of the genetic diversity within species. For example, Hammond said, the G2P-SOL project aimed to sequence 50,000 genomes of solanaceous plants (nightshades), such as tomatoes, potatoes, aubergine, peppers, coffee, and tobacco, especially varieties developed by indigenous peoples and local communities. All of this genomic information and associated data, Hammond said, could be combined with genome editing and gene synthesis to enable digital access to genetic resources without transfer of materials. He said this was already a reality with some smaller organisms, such as influenza virus. It is a particular concern, Hammond stressed, that many genomes are presently being placed online in databases that are “public domain” or that do not implement ABS as part of a data access and use agreement. This allowed corporate patenting of sequence data, Hammond said, and would give rise to biopiracy – causing problems for the implementation of the CBD’s third objective, fair and equitable sharing of benefits arising from use of genetic resources and potentially also for its second objective, sustainable use. Hammond concluded by calling on governments to address this issue by mandating a technical expert group to finish a scientific analysis of the impact of genome sequencing in combination with gene editing on the Convention’s objectives, the results of which would enable the CBD to update ABS approaches to account for the new reality of digital access to genetic resources. A brief and vigorous discussion ensued before the side event broke for the resumption of the SBSTTA meeting. Over the course of the week, a SBSTTA plenary and contact group of negotiators from CBD Parties discussed synthetic biology in detail, ultimately producing a recommendation to the CBD Conference of the Parties, which meets in Cancun, Mexico in December, for continuation of the CBD’s work on synthetic biology. Important elements remain in brackets, however, due to strong opposition from developed countries. These include digital sequence data, the definition of synthetic biology, and work on socio-economic, cultural and ethical impacts. The contact group and the decision ultimately adopted by SBSTTA will be more fully described in a forthcoming article. Video: Sacred vs Synthetic: Competing Visions for Life on Earth Webinar: Are GMOs 2.0 in your food and cosmetics?